Tutus are just about the cutest thing on girls of all ages. My girls have worn them for dance class, birthday parties, and lots of Halloween costumes. 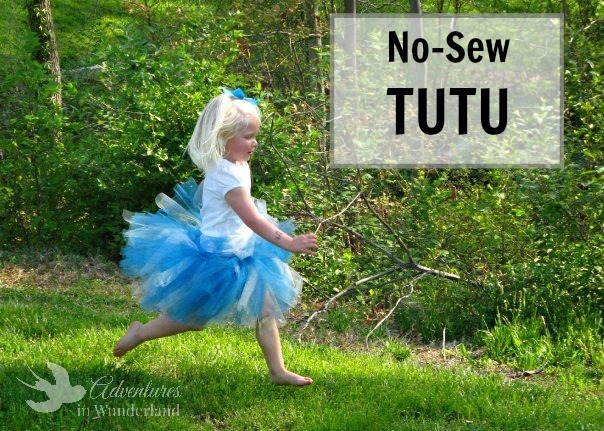 When my oldest was just a tot, I decided it was time to learn how to make these adorable tutu skirts and I’d love to share that along with you. They are really quite simple to make and do not involve any sewing! The cost to make a no sew tutu skirt is really just a few dollars and take about around 30 minutes of your time. They are so simple to do that my oldest daughter enjoys making her own! We use them for costumes, especially for those last minute dress-up days or Halloween Costume changes. You will need a couple spools of 6″ tulle (I use about 75 yards for a children’s tutu). These spools are sold in most craft and fabric stores. 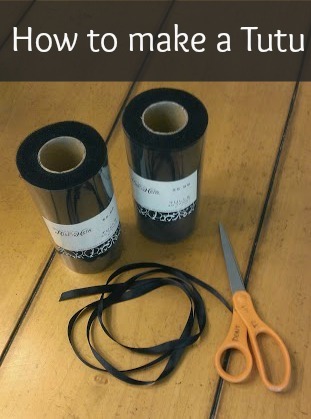 If you cannot find the spools, you can purchase tulle at a fabric store from a bolt but you will need to cut it into 6″ strips. Grab some ribbon, a tape measure and scissors and let’s get started! First, you will need to decide how long to cut your ribbon. Wrap it around the child’s waist and leave enough length (about 12″) on each side to tie a bow in the back. 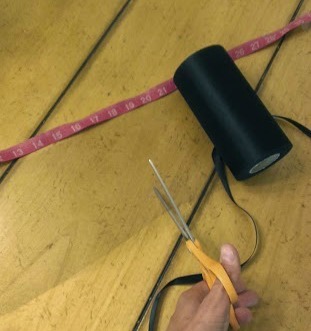 Next, set your tape measure on a flat surface and roll out your tulle. 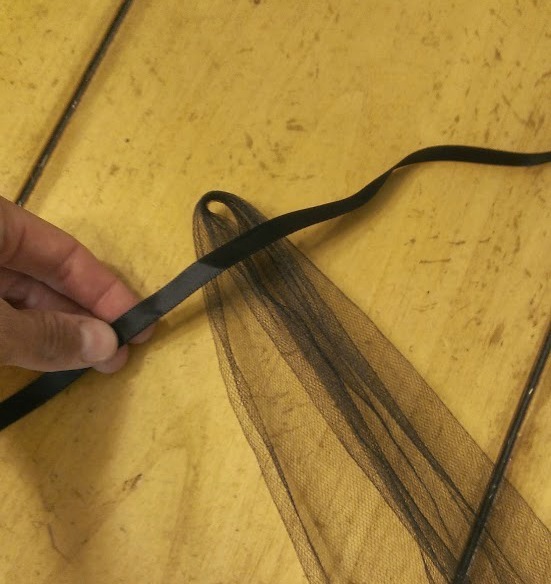 Cut the tulle into 16-22″ lengths depending on the size of the child. I used 18″ for my 3 yr old shown above. 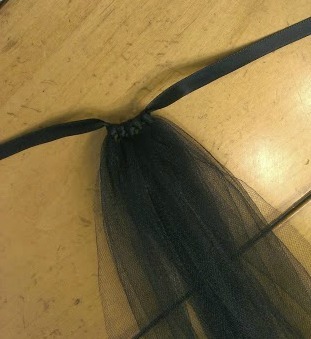 Take each strip of tulle, fold it in half length wise and place it under the ribbon. 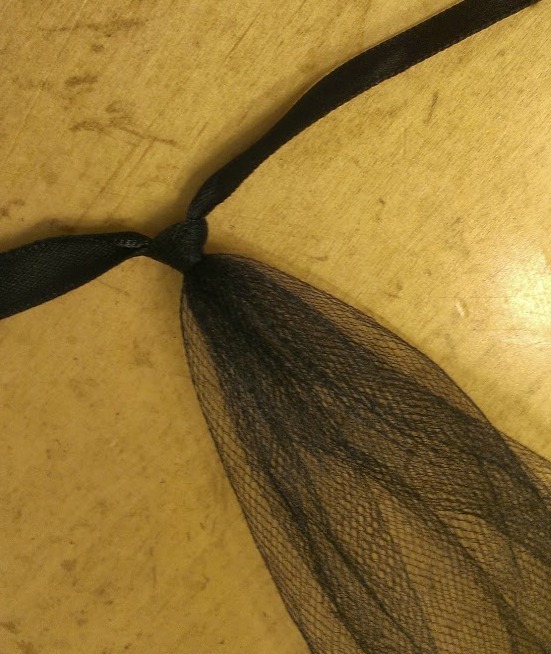 Fold the tulle over the ribbon and tuck the ends into the top loop. Pull the ends tightly around the ribbon to form a sturdy knot. 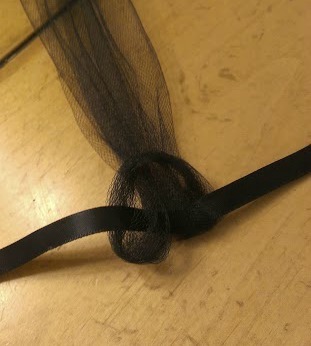 Continue to tie the strips of tulle along the ribbon. Once you have finished, tie it around the child’s waist and VOILA! An easy tutu! To finish off the black cat costume we added a black shirt and leggings that we had in the closet ( leotard would work perfect too) and some store bought ears. I used some face paint to add the nose and whiskers. Total time was 30 min. and total cost was around $15. So many variations can be done with the tutu costume. In previous years we have done a tutu for Tinkerbell, a bunny rabbit, a monarch butterfly and a pumpkin….the possibilities are endless! This is so great , I did a blue tutu for my daughter. She was so cute. Very easy to make. wonderful! Glad you found the tutorial helpful - I'm sure your daughter looks adorable in her new tutu!